I gave up coordinating family outfits for Easter a few years back. I realized that for many years I thought about what we would wear more than I thought about the fact that Jesus was alive. Do you really think he cares about what we wear that morning to church? He sees straight through our best dressed faces and outfits, straight to the core of our souls. Jesus cares far more about the condition of your heart than the clothes hanging on your body. So who’s up for our second annual Easter bible reading challenge?!?! Last year we read the book of John. This year, we will be reading the book of Mark. It was so powerful to read the events of Jesus’ life, miracles, obedience and resurrection leading up to Easter. 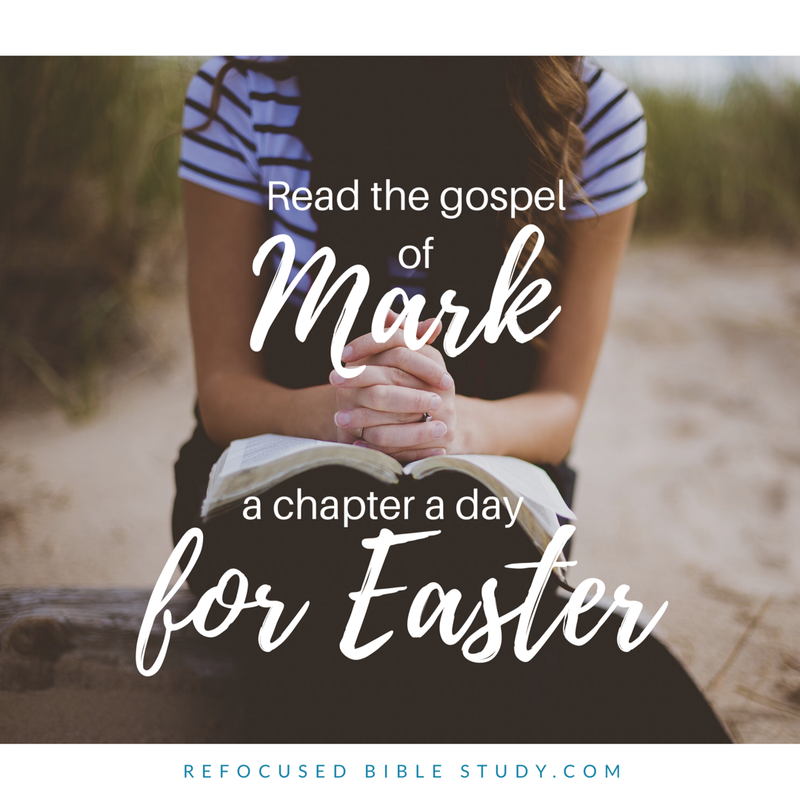 This year, we will start reading Mark on April 1st, reading one chapter a day until we read the last chapter, all about the resurrection, on Easter! Even if you read the last chapter after church, a big lunch, Easter egg hunt, and the kids go to bed that night, you’ll exhale a sigh of praise with a full heart after reflecting on Jesus’ life and words the weeks leading up to this sacred day. Let’s get back to the basics and read the gospel of Mark together! Are you in? Comment below & let me know you’re joining us! I am marking my planner with the chapters and will be joining in for sure. What a great way to move through the Easter season. What a great plan! I’m in! Love this. This year for lent I took on an intensive bible reading schedule. Meaning Im actually reading my bible:) I feel my heart is in such a ready mode this year. I’m so glad, Stephanie! I plan on participating in the April picture plan you shared. Thankful we connected! Yay, Sally! What ages are your kids? Mine are 6, 7, and 9. This will be a lot of scripture for them but I am praying it’s a beautiful time together in his Word. Stay connected on how it’s going and let’s swap ideas. Thanks, Lauren. We’d love for you to join us! Thanks, Easter is such a powerful time! That’s wonderful, Leli! We can never have too much of his Word. He’s so good!! !